You know how sometimes someone leaves a comment, and its gently joshing, or perhaps not even vaguely offensive at all, and I get all twistyknickers over it, and no one can quite work out why because all they said was x? Well clearly not if all they said was x. It would be quite pointless indeed to get ratty about that. It might be a kiss, after all. .. well, Then Im sorry. I want to explain why, but its difficult, I cant – not really. Im guessing that most of you were writing those comments whilst waiting to see your psychiatrist. You all clearly have issues! Just incase you didnt notice they are only paintings and guess what you dont have to look at or purchase one if you dont want to! Also i find it very strange that people who clearly despise Thomas Kinkade and his work seem to know an aweful lot about him. May i suggest that if you sad bastards went out and had a life you may find that your life is far more interesting than this sad website!!!!! Which is fine, whatever – water off duckback, horses for courses etc. But its just that not here, but other places, I get that kind of comment on content that I write up to 50 times a day. Im worthless. what I write about is pointless. What I actually write about the stuff that is pointless (did they mention its pointless? Well, it is) is horseshit, blah blah pointless, blah blah shite, blah blah sad, blah blah loser, blah blah Anna Pickard has no life, etc, etc. The problem, of course, is not particularly me. Its my subject matter. Ive unfortunately chosen a light weight specialism. I want to write about television for a living. I love writing about television. But apparently everyone who reads me ever thinks I shouldnt, and the concept should be banned. And its alright to have a pop there, you see, because when I write in those different and varied places, Im a journalist. And therefore automatically diabolical and eminently detestable. 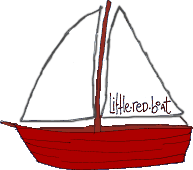 So when I come back here to my lovely lovely little red boat, I do just want it to be a comforting thing, because here I am blogger rather than j********t, and bloggers like bloggers, in theory. We are all members of the Blah-Blah sistahood. And thats why Im touchy when its a bit not. Because sometimes Ive had to click through so many comments telling me what I write about is tosh that I just cant take it, because Im weak, and have skin only as thick as wet tissue. And brilliant. Now Im crying again.